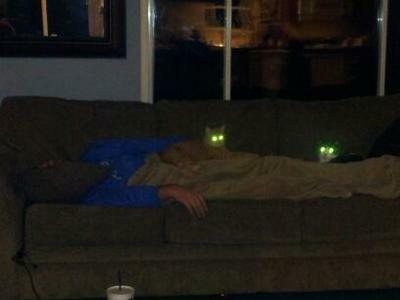 The other night I fell asleep on the couch. And our two cats, which normally hate each other, both climbed on me a took a nap with me. My wife took this photo, because I would never believe that they both slept on me. And then i got really creeped out when i took a second closer look. I you look at the reflection in the window above the cat on the left, there is a reflection of our kitchen window. If you zoom in, you can Clearly see two faces in it.